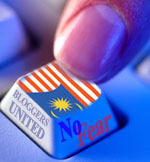 Posted by elizabethwong in "We can do better", Current Affairs, Economy, Malaysia. Word is there may be another hike before Budget this year!!???!! Be part of this historic protest! Posted by elizabethwong in Current Affairs, Economy, Malaysia, Note2Self, Politics. Even my normally cool capitalist bro freaked and scheduled an emergency family meeting to go through our family finances together. Last night at Machap Baru, Melaka, during a ceramah which i shared the podium with Chegubard, Mike (Kapar MP) and Mr. Tai (Perak Exco). Mr. Tai, towards the end of his speech which centred on the fuel price hike, told the audience to get their pens ready as he was going to give them a very very important telephone. An online video done by a bunch of young fellas for 12th GE. Posted by elizabethwong in Malaysia, Politics. Between the last petrol price hike and this latest one, we should have ‘saved’ RM 9.9 billion, said to be allocated for improving public transport. No one would object such noble intentions, but …. For RM 9.9 billion, where is the state-of-the-art public transport? Subway stations? LRT extensions? Increased feeder bus service? Bicycle lanes? Anything? Now we’re told we would ‘save’ RM 13.7 billion a year after the new prices take effect today. The government is expected to save RM13.7 billion under this new subsidy restructure and other levies. The figures are derived from the savings made by state-owned oil company Petronas in gas and oil (RM8 billion), petrol (RM4 billion) and the independent power producer and palm oil (RM1.7 billion). But at least we have a new RM 3.45 billion double-tracking rail project Seremban-Gemas awarded to Ircon (India), to reciprocate the Indian govt giving a RM 1 billion road project to Scomi group. Posted by elizabethwong in Human Rights, Malaysia, Politics, RIP. A ‘behind the scenes’ video of Toni’s beautiful voice and of our mad rehearsal that Sam and Jerry did, which was only available as a podcast until Jerry put on YouTube today. Toni sang ‘Like a Star’ then, for Suaram’s Tribute to Human Rights Defenders a year and a half ago. Today, she joins the rest of our stars. May she have a good journey home.